The rotating padded seat reduces twisting and reaching while in the shower; seat rotates 360-degrees and locks every 90-degrees. This Bath Stool with a Padded Rotating Seat from Drive Medical, is the perfect shower and bathing aid if you are someone who seeks or needs extra levels of safety, security, comfort and versatility. This free flow movement can greatly reduce the twisting motions and other forms of stress that are commonly placed on your back, arm and shoulder muscles whenever your legs are forced to remain stationary while the upper portions of your body are forced to turn and twist when reaching for an item. As an additional safety measure, the swiveling seat can also be locked into place every 90 degrees. If that wasn’t enough, this superior bath stool also comes with a limited lifetime warranty, removable tray for easy and convenient storage, and only weighs 5-lbs. 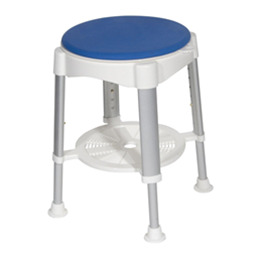 The padded seat can be removed for easy cleaning and can be adjusted up or down from 16" to 23".Once the Bath Stool with a Padded Rotating Seat from Drive Medical becomes your trusty companion, you’ll never need fret again about the possibility of slips, falls or skeletal injuries while bathing. Go ahead…Experience the Drive Difference Now!